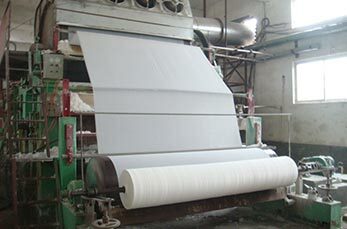 Sanitary paper contains toilet tissue, toilet, facial tissue, and napkins paper can be produced by using Leizhan paper machinery and innovative paper making solutions. Leizhan special designed sanitary paper manufacturing line contains: sanitary paper stock preparation line and sanitary paper production line. Machines contained in the sanitary paper stock preparation line: vertical hydrapulper, dump pump, high density cleaner, pulp chest, pulp pump, claflin refiner, double disc refiner, whiter water pump, etc. Due to various raw materials and production capacity, Leizhan delivers various and tailored sanitary paper making solutions for paper producer. Sanitary paper making machinery contains the following parts: Drum Roll, Clean Roll, Couch Roll, Head-box, Vacuum Cylinder Mold, Guide Roll, Expansion Roll, Electric Stretcher, Penumatic Guide Device, Flat Box (Inlaid ceramic panel), High-Pressure Mobile Shower Pipe, Low-Pressure Shower Pipe, Vacuum Pressure Roll, Doctor Blade , Dryer Cylinder, Air Hood, Dryer Cylinder’s Doctor Blade , Short Oil Site, Wall Board,Handrail, Frame, Horizontal Pneumatic reeling Machine, Foundation Section, Mechanical Drive, Variable Frequency Drive, Squeeze Roll, Rotating Joint.